You will be surprised with how affordable a million-dollar smile can be with orthodontic financing! Orthodontic treatment is a very worthwhile investment for the overall dental, medical, and psychological well being of children, adolescents, and adults. In fact, dollar for dollar, braces or Invisalign are absolutely one of the best investments you can make in your overall appearance and health! Put simply, we believe everyone should have access to a sensational smile. Drs. 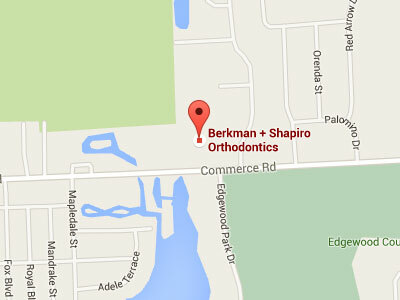 Berkman & Shapiro are sensitive to the fact that everyone has different financial needs, and therefore offer a wide variety of zero down payment and no-interest payment arrangements. Prior to beginning any treatment, we will discuss your financial and insurance options in detail. We accept virtually all insurance plans, and we will gladly work with your insurance provider to help offset the cost of treatment. At your initial visit we’ll tell you exactly what your out-of-pocket costs could be, based on your unique situation. You’ll like our flexible terms and customized approach. Please ask us about the wide variety of financial options available in our office. If you have insurance that covers orthodontic treatment you may benefit from reduced personal costs. Insurance policies vary widely, and we will help review your particular plan to help you obtain the largest covered benefit. As your teeth become straighter we will gladly generate and file your insurance assignment to ensure that your benefit is maximized and your out-of-pocket costs are as low as they can be. We offer gift certificates in a variety of denominations for friends and extended family members (grandparents, aunts & uncles, etc.) who would like to give the present of a sensational smile. Please feel free to contact any of our team members for more information.